"THE MAN WHO THINKS HE CAN"
TEMPERAMENT CHANGE UNDER MY DOMINANT POWER. 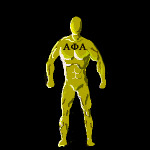 I AM ALPHA PHI ALPHA!! !